In a post-societal collapse, vitamin and mineral deficiencies and nutritional shortages will be very serious challenges to overcome. Hey there, Ready Nutrition Readers! How are you guys and gals doing today? This article is Part 1 of a series on serious deficiencies of the human body encountered in a post-collapse/”Mad Max” type of world. These deficiencies can be prepared for; however, preparation must also take the form of knowledge regarding such problems, not merely the gathering of supplies. The information presented in this article covers iron deficiencies and the causes, as well as suggesting some methods to help. The information does not, nor does it intend to diagnose, treat, or prescribe medication or any of the actions outlined. The article is for informational purposes only. Consult with your licensed, certified, and trained family physician should you have any of the conditions outlined herein. One of the biggest problems in a survival scenario is lack of wholesome and nutritional food. Even on deployment with the U.S. Army, I must say that (on average) during a 3-4 month deployment, I would lose about 15-20 lbs. Of course we had rations and some supplements packed with us; however, the challenges were posed physically that translate to the same physical stressors that occur in a societal collapse. We operated in third-world countries in Special Forces where all of the things most people take for granted in the U.S. (such as clean water, food, and good medical care) were nonexistent or scarce. Most of the time we needed to supplement our rations. Iron and protein deficiencies had to be carefully guarded against. 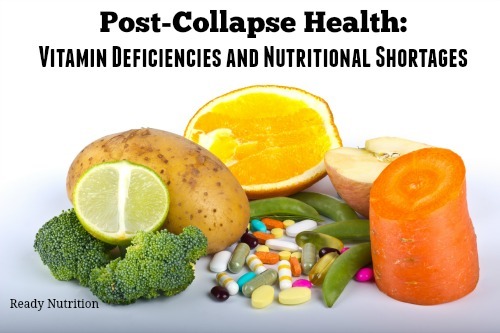 Keep this in mind: In a post-societal collapse, vitamin and mineral deficiencies and nutritional shortages will be very serious challenges to overcome. In this vein, we will first cover some terms and definitions essential to understanding iron deficiency. What is iron? Iron is a metallic element found in nature that is essential for the formation of chlorophyll in plants (although not part of the chlorophyll) and part of molecules of hemoglobin and myoglobin in humans and animals. Hemoglobin is what transports oxygen in the blood, and the “heme” portion contains iron that is the binding carrier. Iron is stored in tissues of the body in the spleen, liver, and marrow in the form of ferritin. The intake valve for this supply is the stomach; it breaks down food and sends the ferritin to the marrow, the complex responsible for the manufacture of…you guessed it…red blood cells. We are not going to cover conversion of ferritin to heme and hemoglobin through hematopoeisis…it is beyond the scope of what you need in the immediacy. We have outlined the basic structural mechanisms of how your human machinery processes and uses/converts iron. Heme or non-heme? That is the question! Heme is one of two types of dietary iron (approx. 10%) obtained in your diet from the hemoglobin and myoglobin of meat, and it is readily absorbed. The other 90% of iron (non-heme) is in iron salt form and not readily absorbed. Daily requirements for iron differ widely by gender and by age/stage of life. Men require 0.5 – 1.0 mg per day, women of menstrual age twice this amount, and pregnant/lactating women need 2-4 mg per day. The reader may wonder why (with such apparently low amounts of iron required) so much more is recommended for consumption. Such is because only a small percentage of iron consumed in the diet is taken in. To absorb and utilize 1 to 4 mg of iron per day, approximately 15 to 30 mg must be taken in through the diet. Once again, before you try to “correct things” yourself, talk to your physician and schedule a lab exam to verify an actual iron deficiency that is problematic. The deficiencies of iron are characterized by anemia, sluggishness, fatigue and breathlessness on exertion, pallor (paleness), decreased hemoglobin count, and mental fatigue/lack of concentration. Causes are too numerous to count; however we can list a few things that are more directly controllable by you: over-consumption of alcoholic beverages, prescription/non-prescription drug use and/or overuse, increased workload (usually coupled with insufficient rest/recovery), stress/anxiety, and lastly, inadequate uptake of iron in your diet. These last three listed and emboldened items are the primary reasons for iron loss during a disaster/societal collapse. Lastly, in addition to standard sources for iron, there are some sources that you may never have even considered, and they are as follows: Burdock seeds, Dandelion, Horseradish, Milkweed, Mustard leaves, Pokeweed, Rose Hips, Shepherd’s Purse, Skunk Cabbage, Sorrel, Watercress. Such resources could be utilized in the events of a survival situation (a remote wilderness area, for example), or if income limits your choices in the happy, wonderful, pre-packaged supermarkets. We posted a book review here at Ready Nutrition a while back on the work “Eat the Weeds,” by Ben Charles Harris, LCC # 73-83951, written in 1973. The work may be out of print, but as you’re here on this site, you’re just a click away from searching Amazon.com for a used copy. The book gives you all of the data you need to be able to forage and gather nutritional meals utilizing the native flora of your area. So there you have it regarding Iron: some information besides just telling you what vitamins and supplements to stock up on. The next installment of our series will cover protein and how protein deficiencies affect you, as well as how to guard against them. Hope you guys and gals have a great day and are enjoying the summer. Take care and we’ll be sending you some more information shortly. The thing lots of folks fail to realize is just how much our intake will need to increase when TSHTF and we find ourselves foraging, gardening, scraping around for this or that, doing extra work to just keep ourselves fed etc,,, the balanced or unbalanced diet thing catches up with you real quick.